To cap off our summer fellowship program, the Haas Institute planned a field trip that would deepen our appreciation and understanding of the struggle for social justice in the Bay Area. 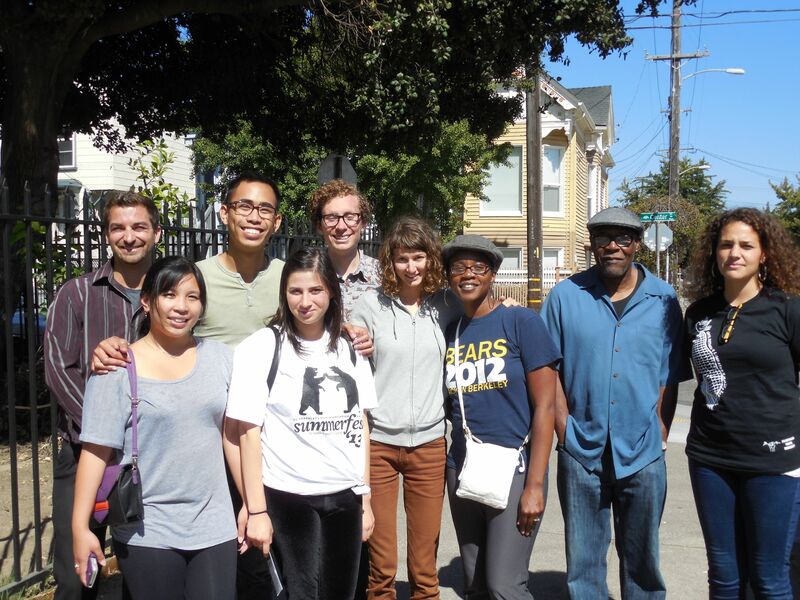 Former Black Panther Party Chief of Staff David Hilliard led a guided tour of the former homes, events and places that were significant to the history and formation of the Black Panther Party in Oakland. 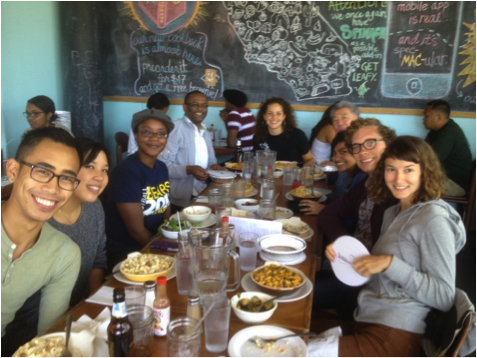 Before the tour began, the Haas Institute’s staff and summer fellows met at Homeroom for lunch, where our plates overflowed with mac n’ cheese. After lunch, we met Mr. Hilliard in front of the West Oakland Library, where he began our guided tour. In our 18-point tour, we visited the homes of the party founders, the location of the party’s office, the Church where the Party served free breakfast for community youth, and the traffic signal that was installed as a result of the Party’s agitation. 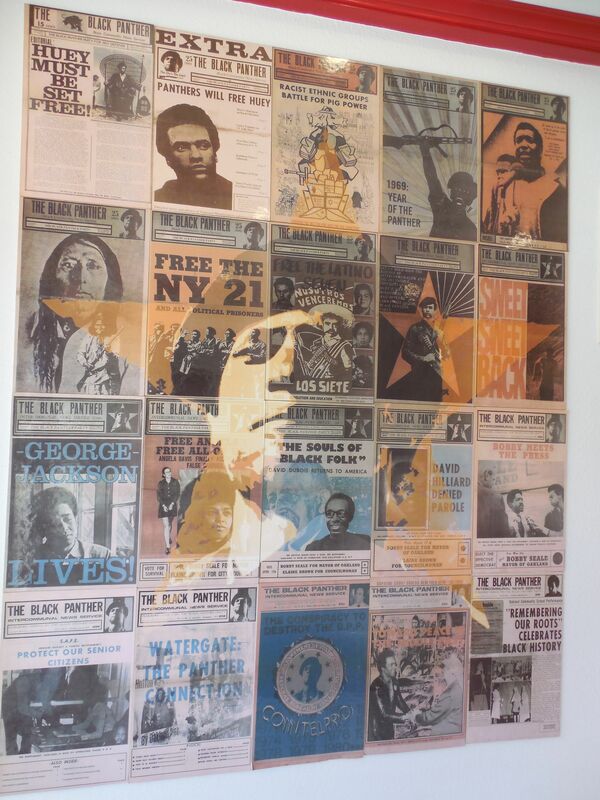 The Party’s efforts put Oakland squarely in the center of efforts to promote racial equality in the late 1960s and early 1970s. His first-hand account described the systematic racism against Oakland’s black communities that was especially prevalent within the police department and other government institutions. His political identity was clearly developed by the realities of discrimination, police brutality, and injustice that were common in the highly segregated neighborhoods of West and East Oakland. Those community needs served as the impetus for the Party’s formation, and shaped the personalities and struggles that allowed for the Party’s efforts and successes in Oakland. His story was inspiring yet filled with a melancholy nostalgia for a time of mobilization and unity that is difficult to find in Oakland’s streets today. His criticisms of kids idolizing the likes of Jay-Z and Kanye instead of politically conscious figures points to the gaps in our broken education system and fixation on making money to solve our individual problems. Mr. Hilliard’s experiences underscored this nation’s challenged history with race, which continues today, as the segregated and red-lined neighborhoods that shaped the experience of Oakland’s African American community are now gentrifying, displacing families to more remote areas of the Bay Area, and the jobs that secured the economic vitality of West Oakland’s African-American middleclass have gradually disappeared. The tour re-opened a chapter in our local history that should be required knowledge to any resident of the Bay Area, and more than this, should be celebrated as some of the greatest moments of collective action and success that took place right in our backyard.